Neoplastic pain is a prevalent symptom within the human and assumedly the veterinary world (Rosenthal, 2013). The multifactorial pain can originate from many modalities including local tissue or bone necrosis and destruction, neuropathic pain, and spinal cord wind up all of which consequently affect the quality of life of these patients (Curacore & Dr. Robinson, 2016). Though less documented in the veterinary world, the ability to influence both biologic and psychological pathways of pain and thereby minimize the associated effects of our current pharmaceutical options can help improve the quality of life of our palliative patients. History: “Freckles” is a 13 year old Great Dane, Lab cross with a progressively weakened hind end including muscle tremors. She is also polydipsic and polyureic with decreased energy. There has been no vomiting, diarrhea, coughing or sneezing. Appetite is present but reduced. Multiple lumps have been noted with slow but present growth and tissue necrosis. Mass aspiration, removal and diagnostic imaging were offered and declined with regular veterinarian. Palliative care was pursued. She is currently maintained on 0.5 mg/kg Prednisone, once daily and omeprazole 1mg/kg once daily. Up to date on vaccinations and dewormer. Physical/Myofascial Exam: QAR with BCS of 3/9. Significant muscle atrophy along the epaxials and hind end appreciated. Abdominal distention with thinning of the ventral abdominal skin present. Multiple focal masses of subcutaneous origin present. One mass is ulcerative in nature. Cervical tension with trigger points along the brachiocephalic present with left side more developed than right. Mild withdrawal response along caudothoracic and lumbar longissimus and iliocostalis muscle groups. Tachycardic (P:100bpm). Remainder of physical exam including neurologic evaluation was within normal limits. Differential/putative Diagnosis: Hyperadrenocortism (Adrenal Carcinoma with metastasis, adrenal neoplasia), Mast Cell Tumors with suspected metastasis, osteoarthritis and chronic pain. Ideally, further western diagnostics would be pursued to help determine the type and class of neoplasia to ensure appropriate point selection and treatment. The Owners are aware of the potential risks associated with treatment towards a non definitive diagnosis. Therefore, our goal is to continue and improve Freckle’s QOL with palliative treatment focused towards reduction of neoplastic pain via treatment targeted towards reducing inflammation, stimulating an anti-tumor immune response (natural killer cells and interferons), parasympathetic stimulation, central and peripheral pain management, and focally targeting adrenals and abdominal distension. Acupuncture Treatments: 3 treatments have been administered to date. Asiamed 0.16 X 15mm for extremities. DBC 0.25 X 15mm for trunk. Treatment 1 (Sept 4th, 2017): Focused on anxiety/stress, appetite stimulation as well as immunomodulatory points. SIZE USED. Points placed were Bai Hai, ST 36, LI4, LI 11, GV 14, GV 20, BL 20, BL 21, HT 7 and PC 6 bilaterally. Treatment was well tolerated with dry needling and manual stimulation. Each point was in place for approximately 20 minutes. Treatment 2 (Sept 12th, 2017): Treatment 1 plus points focused on the adrenals via BL 22, BL 23, BL 52 bilaterally, as well as BL 10 and focal points along the brachiocephalic muscle (Left side> right side). Similar tolerance and treatment time pursued. Treatment 3 (Sept 19th, 2017): Treatment 2 plus electrical stimulation from BL21 to BL23 (see photo). Truncal points were well tolerated for 30 mins. Electroacupuncture along the Bladder Line (Frequency of 2.5, Hz 2.5-3). Extremity points were placed for 15 mins with exception of LI4 which was well tolerated for 20 mins. I found this case challenging due to the significant degree of muscle atrophy. My awareness of needle size selection and depth placement was challenged. 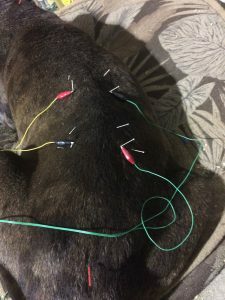 Normally, a 0.25 30mm needle would have been used in a dog her size for truncal treatment but I did not feel comfortable going deeper than 15mm. Precise point placement was achievable due to the palpability of most bone landmarks. Outcome: A drastic change in Freckle’s demeanor and physical exam has yet to be noted, however, owners have noticed an increase in appetite and energy level with increased comfort moving around. I do not yet feel comfortable reducing her current level of pharmaceutical therapy, however, I am now more comfortable maintaining her without the addition of opioids or further anti-inflammatories. I plan to continue therapy with increased focus on pelvic limb weakness including electrical stimulation of her lumbosacral region and hip triad. Overall, I remain positive with the role of acupuncture in improving the QOL of our palliative care patients. It would have been interesting to see if a reduction in opioid administration could have been pursued should Freckle’s have been previously maintained on such pharmaceuticals. I hope with further treatment we will be able to maintain her current level of comfort and potentially lengthen and improve her current life expectancy. Curacore & Dr. Robinson, D. D. (2016). MAV Lecture 08-04 “Cancer”. Donna M. Raditic, D. C. (2014). Evidence-based Integrative Medicine in Clinical Veterinary Oncology. Vet Clin Small Anim , 831-853. Robinson, C. a. (2016). 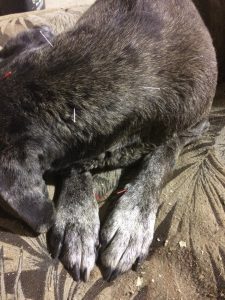 Medical Acupuncture for Veterinarians – Canine Point Mini-Manual. Rosenthal, W. L. (2013). Acupuncture for Cancer Pain and Related Symptoms. Curr Pain Headache Rep , 17:321.